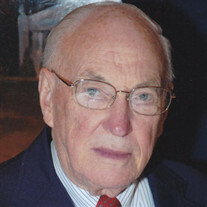 Dudley A. Hawley, Jr., beloved son of the late Agnes (nee Washburn) Hawley and Dudley Allen Hawley. Beloved husband of Marias S. Hawley (nee Spencer). Dear father of Dudley A. Hawley, III (Elizabeth nee Mott) of Fox Chapel, Pennsylvania and Elizabeth S. Hawley (David A. Kennedy) of Novato, California. Dear grandfather of Alexander W. Hawley (Chelsea nee Henderson) and raham A. Hawley. Dear brother of E. Washburn Hawley of Chagrin Falls, Ohio and the late David W. Hawley. Dear brother-in-law of Elizabeth Spencer Ruppert, M.D. (the late Dr. Richard Ruppert) of Catawba, Ohio. The family prefers that those who wish may make contributions in his name to Hospice of the Western Reserve, 17876 St. Clair Avenue, Cleveland, Ohio 44110-2602, Hawken School, c/o Advancement Office, P.O. Box 8002, Gates Mills, Ohio 44040-8002 or The Memorial Fund of Fairmount Presbyterian Church, 2757 Fairmount Boulevard, Cleveland Heights, Ohio 44118 where Memorial Services will be held at the church on Saturday, May 20 at 4:30 P.M..